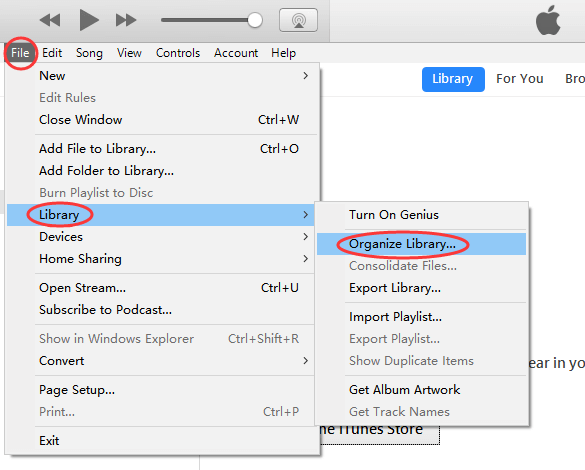 How to Save iTunes Library to iDevice/External Hard Drive? Have you ever been faced with the terror of losing important files? Especially your media files. Believe me, the pain can be very excruciating and you really don’t want to have that kind of experience. If you’ve had a similar experience in the past, I guess this should serve as a wakeup call. Having recent backups of your file is the way to go. Your iTunes library stores all your media files including music, videos, TV shows, etc. both purchased and non-purchased. The iTunes library comprises of two files; the iTunes library files and the iTunes media folder and they are responsible for all your iTunes media files. Backing up your iTunes library ensures that your efforts of collecting and organizing a library over the years doesn’t just get washed down the drain. This way, even when there is an unforeseen hard drive failure or in a case of a stolen or lost computer your mind would be at peace knowing that you can easily restore the entire library anytime. Today, we will provide answers on how to save iTunes library. We want to share with you guys a great application solely designed to drastically enhance you’re your iTunes user experience. 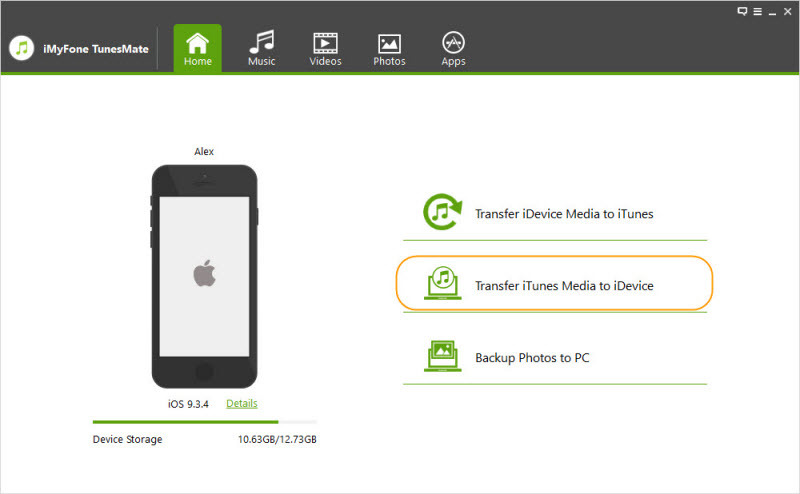 With this app, you can effectively manage your iPhone media files like a pro. This tool brings you exciting new ways to manage your iOS device. iMyFone TunesMate is a third-party iOS file transfer tool that is 100% convenient to use and free from error. We believe the iOS community shouldn’t be bound and scared of limitations, errors, and loss of data. Our goal is to create a safe and conducive platform for iOS users by designing an amazing tool, powerful enough to allow for a safe and secure transfer, backup, restore, and complete management of iOS device. Available for both Windows and Mac computers. If you’re looking for how to save iTunes library, iMyFone TunesMate should be your go-to. It totally eliminates the chances of you losing your files, it is fast, allows for unlimited IDs, and there are no restrictions. Easily and speedily backup your entire iTunes library or selected files and restore them anytime. Transfer data freely and securely from any iOS device or computer. Transfer both purchased and non-purchased music. No restrictions. Allows you to rebuild your entire iTunes library without opening iTunes. 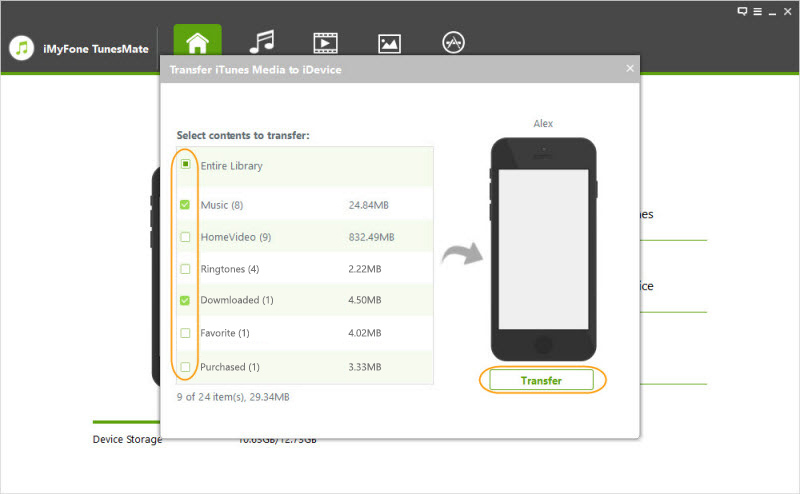 Allows you transfer music, videos, audiobooks, photos, albums, podcasts, etc from iTunes to iPhone/computer with ease. iMyFone TunesMate ensure there are zero data loss. Step 1: Download and install iMyFone TunesMate on your computer. Step 2: Launch the software. Step 3: Connect your iPhone with a USB cable. Step 4: On the home screen, hit “Transfer iTunes Media to iDevice” to transfer iTunes library. Step 5: This will scan your iTunes library media files and have them displayed in a list. Step 6: Choose the entire library and hit "Transfer" to begin the process. Step 7: When it’s complete, click "OK" to finish. 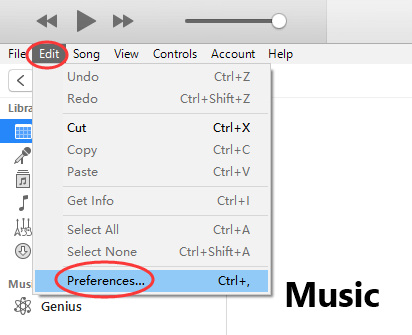 Click on the "Edit >> Preference" window to open. 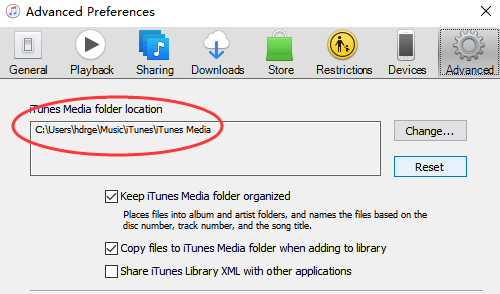 The box below the iTunes Media folder location shows the location of your iTunes media folder on your computer. Tap the "File menu >> Library >> Organize Library". A window pops up, choose "Consolidate files". This will move every used file in your iTunes library to one location. 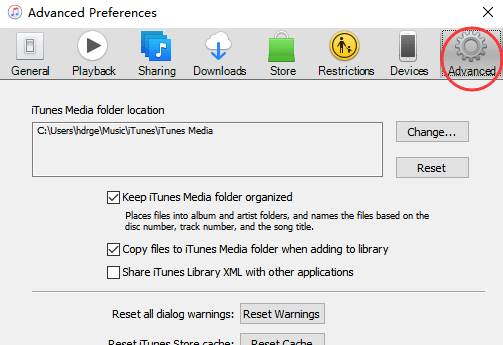 Next to Reorganize files in the folder "iTunes Media" is a box, check the box. If you have your files organized into subfolders already for Music, TV shows, podcasts, audiobooks, movies, etc. the box will be greyed out and not clickable. 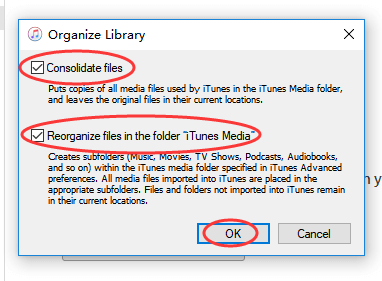 Hit "OK" to consolidate and organize your iTunes library. Note: Rather than moving the files, consolidating files will actually create duplicate files. To save space you might want to delete the duplicates. You found your iTunes media folder, consolidated your iTunes library, now it’s time for the backup. Connect your external hard drive to the computer and browse your computer to find it. Look for a folder called “iTunes Media”. You’ll find this in the path we followed earlier. When you locate the folder, click and drag it to the external hard drive. This will copy your iTunes library to the hard drive. Once the transfer is successful, you’ll now have your iTunes library backed up in your external hard drive. Disconnect the external hard drive. We have looked at how to save iTunes library to iPhone using an awesome transfer tool called iMyFone TunesMate and also how to save iTunes library to an external hard drive. No doubt there are lots of iOS users that are not aware they can easily backup their entire iTunes library. We are glad you read this article today and we want you to create a backup today, it’s easy and can be done in just a few minutes. WinThruster Review: The Most Shocking Discoveries about WinThruster!